Rebuilding Texas, together | KaBOOM! On August 25, 2018, KaBOOM! 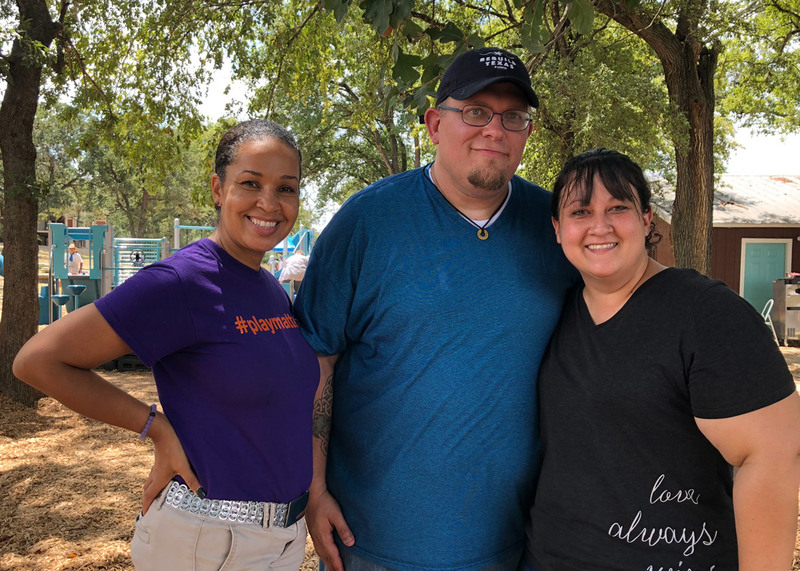 Vice President of Partnership Development attended a playground build at Family Link Treatment services in Gonzales, Texas. In the story below, she details her experiences on that day. Last week I had an unforgettable experience. On the anniversary of Hurricane Harvey, I witnessed the joy and laughter of kids who, just one year prior, were faced with fear and uncertainty after the storm hit Gonzales, Texas. 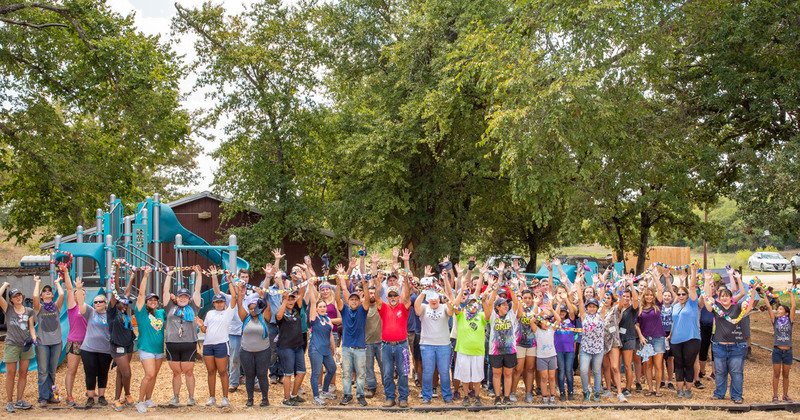 This past Saturday, more than 200 volunteers came together to help build a playground for the kids of FamilyLink at Legacy Ranch, a foster and adoption center in Gonzales. During the hurricane, the team at FamilyLink worked tirelessly to make sure the kids felt safe, despite the rising water, flooding and debris caused by the storm. The devastation that a hurricane can bring to a community impacts everyone, and for kids, the experience can be especially stressful. Play is a way to restore normalcy in the lives of kids. And play can also provide a positive outlet for the community. I saw that come to life at FamilyLink. The volunteers have faced many hard days since the storm, but last week they came together to make a difference in the lives of the kids at FamilyLink. I was reminded of the transformative power of community unity, and that love is powerful enough to heal any circumstance. There's been great progress made after the storm, and there's still a lot to do to complete recovery in Southeast Texas. But I left Gonzales encouraged by the community, knowing that we are all much stronger together, and when we unite for a common purpose, anything is possible. While I was at the build, I also met Nikki Morton, who has worked at FamilyLink for the past 6.5 years. Nikki is a remarkable woman who is living a life of service that I admire. She and her husband, Matt, met through FamilyLink. Not only do they both dedicate their time to the kids at the ranch, but they are extremely thankful for this program. FamilyLink has allowed them the opportunity to open up their home and hearts by foster-adopting seven kids from the program! Whenever they get to play, they don't have to think about their past—they get to just focus on being kids. This playground will be a safe haven for them. Knowing their stories and hearing them laugh again, it's just amazing. Their resilience is inspiring. When I left the ranch at the end of the day, I felt inspired and touched to my core. I will carry the stories of Nikki, Matt and all of the kids of FamilyLink with me. The fabric of their community is strong and, like the playground, will last for years to come. Not only are these kids recovering and rebuilding from Hurricane Harvey, they are recovering and rebuilding from their pasts. With the peaceful safe haven Legacy Ranch and their new playground provides, these kids will be able to build back better than they were before. It was such an honor to be a small part of their work. 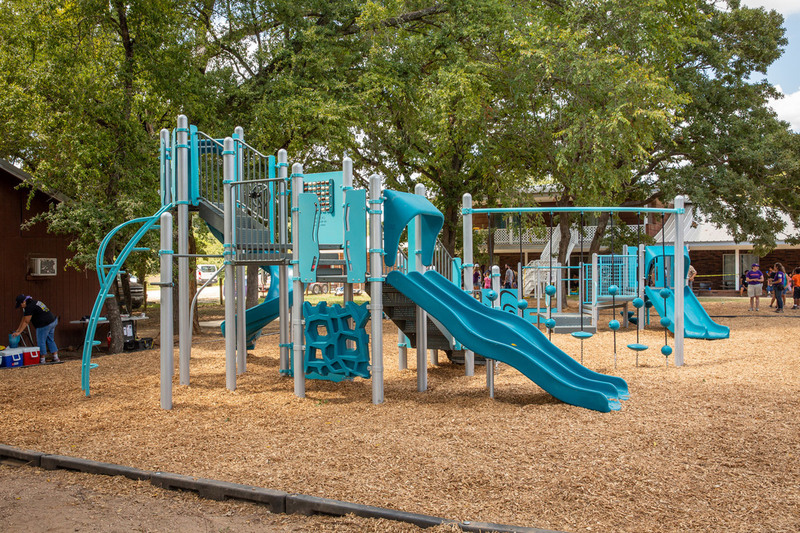 This playground in Gonzales marks the 13th playground we've built in partnership with communities affected by Hurricane Harvey. It is also the first of 15 playgrounds KaBOOM! and Rebuild Texas Fund will build together over the coming months. In addition to these playgrounds, 10 Imagination Playground grants and 10 Rigamajig grants will be awarded. Together, we are working to help kids and communities heal after this natural disaster and regain a sense of normalcy. In August 2018, Lysa Ratliff was featured on HLN's MichaeLA program to discuss the work being done in Texas to restore joy in the lives of kids impacted by Hurricane Harvey.